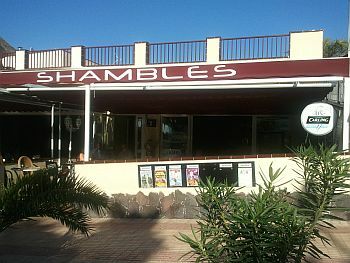 Shambles Bar Los Cristianos is yet another bar situated in the El Mirador area, up the hill behind Los Cristianos. It is open all day, with a fully functioning restaurant, beginning with breakfast and going right through to evening, where such delicious things as steaks and lamb shanks are on offer. Numerous posts on various forums all say how excellent the food is in Shambles Bar - and the prices are reasonable. This low price trend extends to drinks, too, where there are special low rates through the day, returning to normal prices at around 6pm. The bar is equipped with big-screen TV, showing all important Premier League football matches. In the evening, regarding entertainment, the accent is primarily on karaoke. However, live acts feature there, too. I can't give you full details of who is appearing at the bar (as things change all the time in Tenerife), but I am pretty certain that the band Crush perform there on Wednesdays. I've also found mention of a compere called Paul Mac. Taking everything into consideration and from customers' comments on forums, this bar is well worth a visit. To find it, walk up the hill away from the sea from the mini-roundabout near the Arona Gran Hotel. When you reach the big roundabout, there's a dual-carriageway off to the right. The bar is just over on the other side of that.